When writing historical fiction work, it’s important to have an outline—a timeline to be more precise. This allows you to keep track of actual dates and events without having to dig through piles of books. This is also useful when you have a specific, complex story possibly with multiple sub-stories. What is the difference between a normal outline and a timeline outline? The normal outline is vertical dealing mainly with the progression of the story, chapter-by-chapter, scene-by-scene. The timeline outline, however, is horizontal, showing mainly the relationships between specific events and character in a specific range of time. You can also see, in a snapshot, other events that occurred at the same time but with different characters. How do you create a timeline outline? Well, you can do it by hand, but you’ll need continuous printer paper because timelines can be very long due to their horizontal nature. Or you can use an Excel program. Or you can use an actual timeline program on your computer. I have done it by hand as well as with a timeline program. Unfortunately, I can’t show you what it looks like when done by hand because the computer can’t scan continuous printer paper. 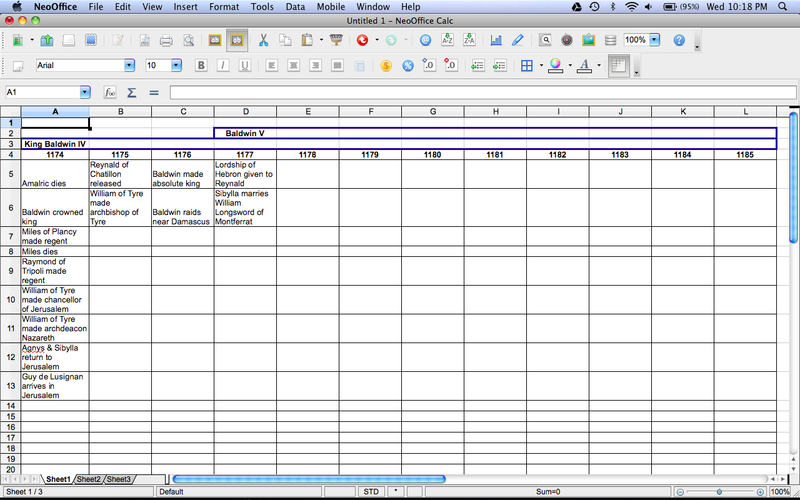 However, here is a screenshot of what it looks like on the computer—at least one part of it. This is from my historical fiction novels, The Last King of Legend series, research I did for Book 2, ‘In the Face of Trials’, so there are no spoilers unless you haven’t read the books—in which cause I can’t really help you, but this IS history, so technically it’s still not spoilers. This is Aeon Timeline. If you did NaNoWriMo (National Novel Writing Month) or Camp NaNoWriMo, and if you won, you obtained a discount for this program for a limited period of time. It’s incredibly easy to use. Let’s break it down. There are multiple timeline templates you can use for your story. This specific one is BC – AD because I have historical dates to use. When I am outlining my fantasy novel though, I tend to just use ‘Years Only,” create a year, and go from there. At the top you see the months and years. It has the ability to go to specific days, but I didn’t use that too much since I didn’t know the exact dates most of the time. In the middle with the little red dots and red vertical lines, the dots are the date of the event with a brief description of the event beside the dot. The line then goes down and hits horizontal lines. Those horizontal lines are the lifetime of characters (in this case ‘King Baldwin IV, Princess Isabella, and Baldwin V). Now, if you look along the blue line of King Baldwin IV’s life, you see blue circles–circles that are full and hollow. The full circles mean Baldwin participated in that specific event, and the number beside the circle is how old he was when it happened. You’d have to turn on ‘Toggle Age Display’ to get that to turn up, but it’s a marvelous tool to have. Now, the hollow circles are events of which Baldwin was present but merely observed. For instance, he only witnessed Sibylla’s marriage to William Longsword whereas he participated in the Battle of Montgisard. There are two other symbols you will see along the characters timeline. First one is a star. You see this on Baldwin V’s timeline in that picture. That represents his birth. The next symbol you will see is a block, and that represents the character’s death. It’s very handy. 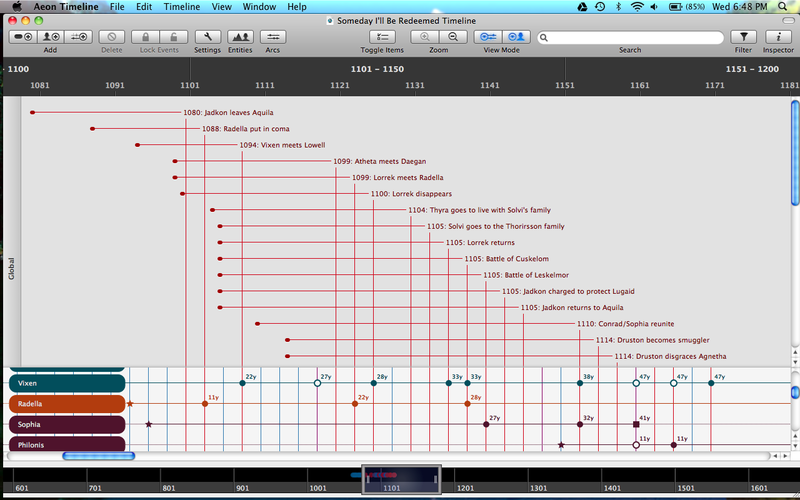 Now, here is a glimpse of the timeline outline from my fantasy universe. This isn’t just one story but rather three different stories happening at the same time, but they’re all in the same world. It was getting confusing in my head, so I made this timeline to understand what happened first, who was how old when what happened, and who was where when that happened. As you can see, this is a little more complex and compacted. There are more characters and more events than what you see in that snapshot, but it gives you an idea of how something like this might turn out. “But Kelly, I don’t have Aeon Timeline. What am I supposed to do then?” I am sure there are other programs available to you, but I haven’t researched them. Otherwise, you can mimic this idea on a spreadsheet or by hand on paper. When I wrote my timeline by hand, I had two characters’ lifespans I wanted to record for sure–King Baldwin IV and Baldwin V. My historical fiction novels ‘The Last King of Legends’ is based on the life of King Baldwin IV, so I had his lifeline go the length of the paper, and below that, I made vertical columns–each column a specific year from 1161-1185 because that was the length of Baldwin IV’s life. Now, Baldwin V was born during Baldwin IV’s life, and because of his importance, I wanted to include his lifespan so I could calculate his age at specific times. I put his lifeline directly above Baldwin IV’s. It looked something like this. I made this as a spreadsheet, and I’m starting at year 1174 due to limitations of space here. Also I didn’t fill in ALL the details of the years. Otherwise that would be spoilers for the books! Now, of course there could more space between each year (sometimes as wide as a small paragraph). In each column, I wrote the events that happened in that year, and so on and so forth. This way I could just glimpse at the timeline and see which year was the busiest or the slowest. I could also look at it quickly and remember I had to set up for this specific event. Does every story require a timeline outline? No. Must every author create a timeline for their stories? No. All of this is merely a suggestion for organization when writing something complex. And I have to admit, it is a lot of fun creating timelines (especially on the computer), so if you’re looking for another way to procrastinate while technically working on your story, there you have it. No, I’m not promoting procrastination–just always try to remember to procrastinate later. 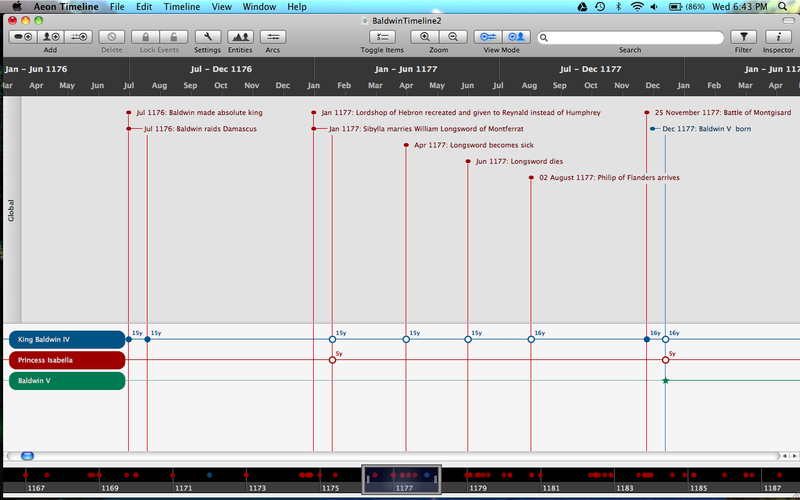 For now, you have a fair idea of how timeline outlines might be beneficial to you. Now, with the next several posts, we will focus on the pros and cons of outlines–to use or not to use or just throw away the outline you had. That is what we will discuss.